The University of Manitoba Faculty Association (UMFA) has won a recent battle with the U of M administration. The war, however, remains undecided. On Jan. 29, the Manitoba Labour Board ruled in favour of UMFA in a dispute over unfair labour practices occuring during the 2016 faculty strike. 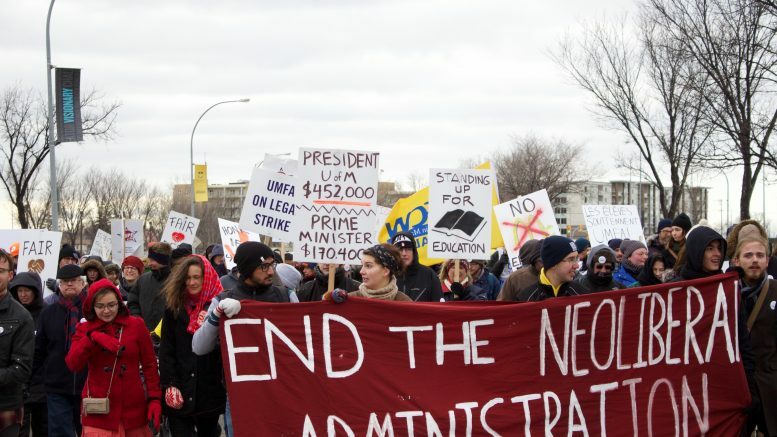 Specifically, the administration failed to notify UMFA that the provincial government ordered a pay freeze during the strike, which in turn jeopardized negotiations. The administration put out a statement saying they “respectfully disagree” with this ruling, claiming they had bargained in good faith. Many students would genuinely like to believe the administration when its issues statements like this: in other words, hold out hope that the administration would not tell a malicious lie. However, after three rulings against U of M labour practices in the past 11 years – two of which occurred in the past year – it is obvious the administration refuses to change. If anything, it is only getting worse. This is only the tip of the iceberg for the administration in following a regressive approach, one that has taken us to a place where education is no longer the primary focus of the academic institution. The past few years have seen the attention of the administration clearly directed toward the corporatization of a public university. What with unfairly and poorly prioritized performance metrics for professors, cuts for three consecutive fiscal years running from 2014 to 2016, and the broad assortment of fundraising drives directed towards large capital projects – flashy new buildings and superfluous upgrades – students should now know where the priorities of the university administration lie: in polishing the exterior of the ivory tower, as its interior crumbles. The unsettling truth is the administration will once again learn absolutely nothing from this ruling, especially as they have publicized in their statement that they are considering challenging the Labour Board. The administration’s behaviour makes the ruling itself even more frustrating. Instead of having to deal with real repercussions, the administration has effectively been given a slap on the wrist for their actions. The Manitoba Labour Board, instead of fining the administration a set amount, decided to let the administration and UMFA work out an amount on their own – which can be up to $2.4 million, or $2,000 per member. This is almost comical in its irony. The party that was ruled to have compromised negotiations is now going to be negotiating the amount of their own fine with the party they used those unfair tactics against. Why should UMFA have to, yet again, negotiate with a party which has no interest in a fair negotiating process? It should be made abundantly clear who will be paying the millions owed to UMFA by the administration: the university as a whole, not merely the guilty parties. When the administration and UMFA negotiate and the members of UMFA lose, UMFA loses out on compensation and becomes governed by externally-imposed workplace rules. There is no such stake at play for the administration in negotiations. Further, when the university administration is fined for unfair practices, they are most certainly not paying that fine out of their own individual executive salaries. When one party is bargaining for their livelihood and the other has virtually nothing to lose, it should be no wonder that the administration is willing to go to great lengths to compromise negotiations in its favour. It is yet another example of the imbalance of power at play. Moreover, this ruling demonstrates the detrimental effect of government interference in labour negotiations. It was never the job of Premier Brian Pallister to unilaterally interrupt negotiations simply to advance a policy that contributed to derailing negotiations. This takes on a disturbing political tone when the leader of the government has been on a warpath against organized labour precisely in the way Pallister has. Students must realize the implications of these actions. The takeaway is that the administration could not care less about the working conditions of its employees, and will do anything to nickel-and-dime the faculty it relies on to operate. If not made abundantly clear last year through the strike, an attack on professors is an attack on students. Working conditions for professors directly affect their teaching, and cuts have long-term, disastrous effects – both directly affect the education of students. While this Manitoba Labour Board ruling is another win for UMFA, professors, and students, it ultimately fails to address the underlying issue. Ruling after ruling shows the administration has not acted in good faith. Why should they suddenly be trusted now?